In 479/8 B.C., the demes of Koile and Melite are protected by the Themistoklean wall and manifest significant residential growth during the 5th and 4th centuries B.C. On this stretch of land habitation had an advantage: not a single raindrop could be trapped on the rocky soil. Today, remnants of residential areas are evident on the large plateau to the west of the Hill of the Pnyx, whereas two-storey houses have been found northern to the sanctuary of Pan, on Apostolou Pavlou Street, as well as on the eastern slope of the Hill of the Muses (Philopappos). It is believed that no space suitable for the construction of houses was left unexploited. Judeich 1931, 124–144; Lauter–Bufe and Lauter 1971, 109–124. Part of a two-storey house of the Classical age, on the eastern slope of the Hill of the Muses (Philopappos), cut into the rock; known as “Prison of Socrates”. 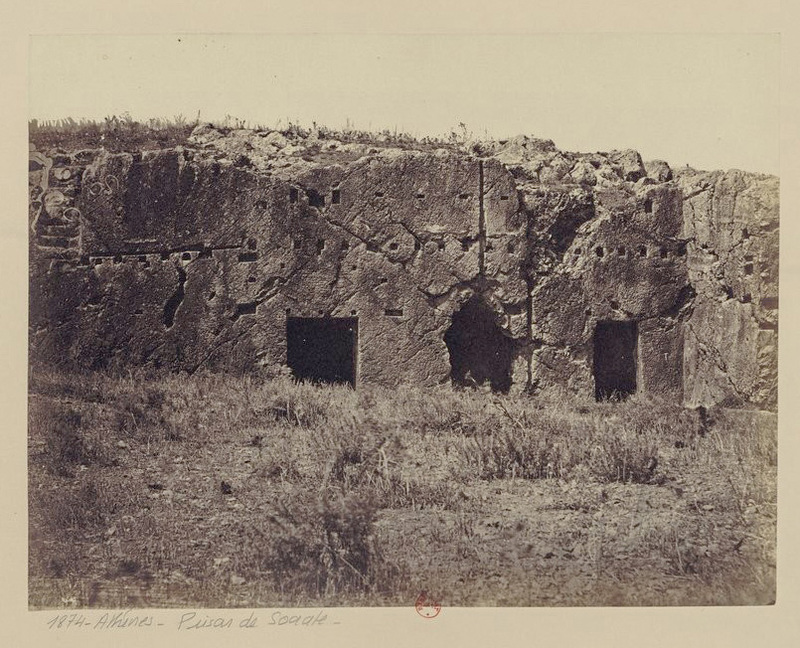 Photograph by Petros Moraitis (1835?–1905).